The era of artisanal coffee is upon us. Gone are the days of plain “morning Joe.” These are times of cupping, tasting, body, balance, bouquet, and flavor notes. In this world of elite coffee, standing apart from competitors, and making a mark in the craft coffee world, requires determination and talent. But UC Santa Cruz has helped give this bumper crop of fine coffee purveyors a strong start. It turns out there are “perks” for being a Banana Slug. Headquartered in Oakland with several shops in the Bay Area, Blue Bottle Coffee has expanded internationally, making inroads in Japan. Lately it’s made impressive forays across the East Coast, as well. Steeped in the ethics classes he took at UC Santa Cruz, Freeman has made a name for himself by combining his passion with an unstinting demand for quality. Freeman is part of a power-couple in the world of high-end craft food. He is married to Caitlin Williams Freeman (Kresge ’97 photography), who left her beloved pastry company Miette in 2008, and now is the resident pastry chef for Blue Bottle Coffee. Inspired to bake by the confectionary paintings of California painter Wayne Thiebaud, Caitlin Freeman decided to re-create those very cakes when Blue Bottle opened a café in the San Francisco Museum of Modern Art. Sue Van Epps, who attended UC Santa Cruz in the ‘70s, co-founded this venerable, Italian-themed coffee shop in the early 1990s. With help from family members, she built the Bear in a space that had been vacated after the 1989 Loma Prieta quake. The shop also has ties to a true craft-coffee pioneer. The very first roaster at Great Bear was trained by none other than Alfred Peet of Peet’s Coffee fame. Great Bear serves light meals but is best known for its coffee drinks. One standout is its Chocolate Coffee Cream (CCC): chocolate, ice cream, and cold-brewed coffee, topped with real whipped cream. This esteemed shop has deep UC Santa Cruz roots. 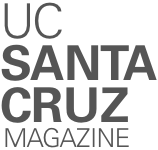 The late Colleen Crosby, founder of Santa Cruz Coffee Roasting Company, attended UC Santa Cruz for a time. Her husband and business partner, Bronson Baker, also attended UC Santa Cruz. The Roasting Company was the first small batch roaster, outside of San Francisco, in Northern California. Crosby was an economics major at UC Santa Cruz. She got her start in the coffee world even before graduating, choosing a study of the coffee market as a senior project. In fact, she was so infatuated by the world of coffee-making that she took a leave from college to start her business. But she never turned her back on UC Santa Cruz; 20 years after her departure, she returned to the university and wrapped up her studies. To this day, Santa Cruz Coffee Roasting Co. is a downtown mainstay where locals hang out for hours and enjoy individually dripped gourmet coffee—innovative when the shop first started out, and delicious even now. In 1989, the Loma Prieta quake wrecked the original location, but the coffee shop moved, a few years later, to its present space on 1330 Pacific Avenue at the Palomar Inn. Walker-Watson has gushed about all the “amazing” coffee her city had to offer, but says her business stood out because of its strong focus on a process she calls “exposure roasting,” which is, essentially, a “light roast.” Slate roasts coffee “seeds” in small batches just long enough to highlight the characteristics that are inherently unique about them. The business started out with a single location in Ballard—a much-loved Seattle neighborhood known for its farmers markets, restaurants, and Hiram Chittenden Locks, where visitors can watch local salmon traverse a “fish ladder.” But the business added two new stylish locations when the Ballard shop began to feel a bit cramped, with lines going down the block. The business is all in the family. The co-owner is her brother, Keenan Walker. Booskerdoo Coffee has two locations in Monmouth Beach and Fair Haven, New Jersey, as well as a mail-order business and a sister company, Booskerdoo Bakery. Now there are plans to move into Asbury Park—former stomping grounds of Bruce Springsteen—with a 2,000-foot space. Much of Booskerdoo’s success can be attributed to its tireless co-owner, James Caverly, who attended UC Santa Cruz from 2000–02. And the funny thing is, Caverly, a Cowell College student, says he “didn’t like coffee at all” while attending UC Santa Cruz. After entering the working world, he initially hoped to be a filmmaker, only to attend a sobering talk by a director “who talked trash about the film industry.” So he gravitated to coffee. Amelia, his then-fiancée—now his wife—came up with the unusual “Booskerdoo” name. “We wanted a new word that meant nothing so we could add meaning to it,” said Caverly.